The 2019 Hugo Award finalists were announced today and I am very honored to be among the finalists for Best Editor (Short Form). I’d like to thank everyone that voted for me. This year’s Worldcon is in Ireland and my family has been looking forward to it for some time now. We (my parents are from Navan and will be joining us, along with Lisa, the boys, my sister, and her family) are taking the week before the convention to visit family and do a little sightseeing. Lisa and the boys have never been to Ireland or a Hugo ceremony. It’s my seventh time as a finalist in this category and I am currently winless. I don’t know if the luck of the Irish or lucky number seven will come into play, but either way, I expect to have a great time. 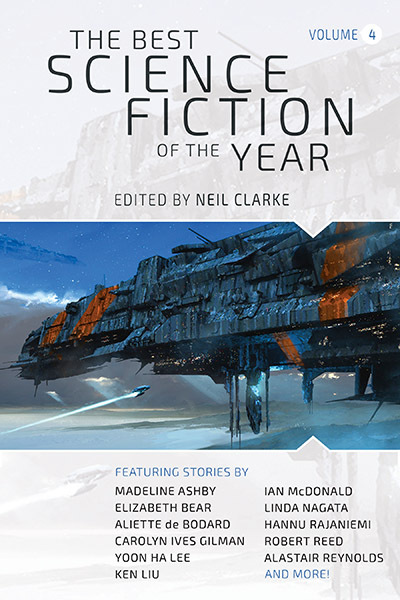 The Best Science Fiction of the Year Volume 5 will be published in mid-2020 and select from science fiction stories (short stories, novelettes, and novellas) originally published in English in 2019. Translations are allowed as long as their first English language appearance is in 2019. To keep things simple, I will be using the publisher’s copyright, magazine’s cover date, or posting date (primarily for online fiction) to determine eligibility. Serialized works will be considered published at the time of the final installment. I strongly dislike reading PDFs, so please do not send me work in this format unless you have no other options. Publishers: If sending a magazine/anthology/collection that also contains other fantasy/horror/other stories, please list the titles of the science fiction stories in your cover letter or email. Magazines: Analog, Apex, Asimov’s, Better Worlds (The Verge), Clarkesworld, Cosmic Roots and Eldritch Shores, Diabolical Plots, Escape Pod, F&SF, Fiction River, Future Tense Fiction (Slate), Galaxy’s Edge, GigaNotoSaurus, Interzone, Lightspeed, Samovar, Shoreline of Infinity, Strange Horizons, Tor.com, Uncanny, and Wired. Magazines: It is traditional for magazine cover date to be used to determine year of publication, however, if a story from a January issue is published on the website of that publication in December of the prior year, that will be considered the first publication date. This is considered an intentional publication by the publisher in the earlier year. Anthologies: If the ebook or an e-Arc of an anthology is made available for purchase (and delivery, preorders don’t count) in the year prior to the official copyright year, the earlier year will be ignored when determining eligibility. If the print edition happens to ship a few days earlier than the official publication date, causing it to drift into the prior year, the copyright date will be used. Unlike the digital publication dates, this is something that tends to be outside the publisher’s control. This is why they are treated differently.